WELCOME TO MY MONEY MISSION ONLINE: MAY YOU ALL HAVE A SUPER SUPER BLESSED SUNDAY! MAY YOU ALL HAVE A SUPER SUPER BLESSED SUNDAY! Sunday Already! Whew...Saturday blew by in a whirl! I was busy outside, in my garden, and from there on, I lost track of time. 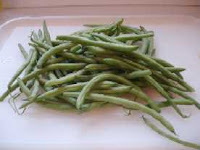 I picked a big bucket of beautiful green beans, and teen daughter helped me stem them. I put them into a big plastic bag in the frig, and tomorrow, I will blanch, cool, flash freeze and pack them. They will be very tasty on a cold winter's day! All You Magazine Blow Out – $15.75 For Two Years!! No tax, and No Shipping! This is a better deal than what I did a few months ago. 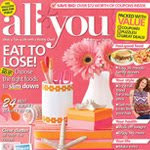 I love the All You Magazine because it is packed with great articles and tons of coupons. Temperature's up. So chill out.. This is what the site says, "Enter your email address to receive a 99¢ coupon for one of our Limeade SONIC CHILLERS™. Refreshing limeade blended together with creamy vanilla soft serve will turn the dial down on this hot summer. Choose one of our SONIC CHILLERS™ - Cherry Limeade, Strawberry Limeade, or classic Limeade. All with whipped topping and a lime, to help you just chill out." Click here to get yours: Sonic Drive In. YUM YUM!!! Thank you for the links and the post. And thank you for coming to see me and always being so sweet. I'll have to check out that All You magazine - hadn't heard of it before! And of course I'll check out the Sonic deal! The green beans sound wonderful and I hope you have a wonderful Sunday! Thanks for checking in on me!! My family is making me crazy and at this point it doesn't seem in my best interest to speak to any of them. Dad's crazy wife is still harassing us all, my mom is blabbing all kinds of things I said to her in private and so is my sister, so basically, I am feeling a little alone in the world!! It's good to have bloggy friends!